A. coriophora ssp carpetana was first described by Willkomm from Madrid, Spain in 1811 and the name "carpetana" refers to the Carpetani who were the ancient inhabitants of central Iberia. Unlike the somewhat unpleasant aroma of the type species A. coriophora, it has little or no scent whatsoever. 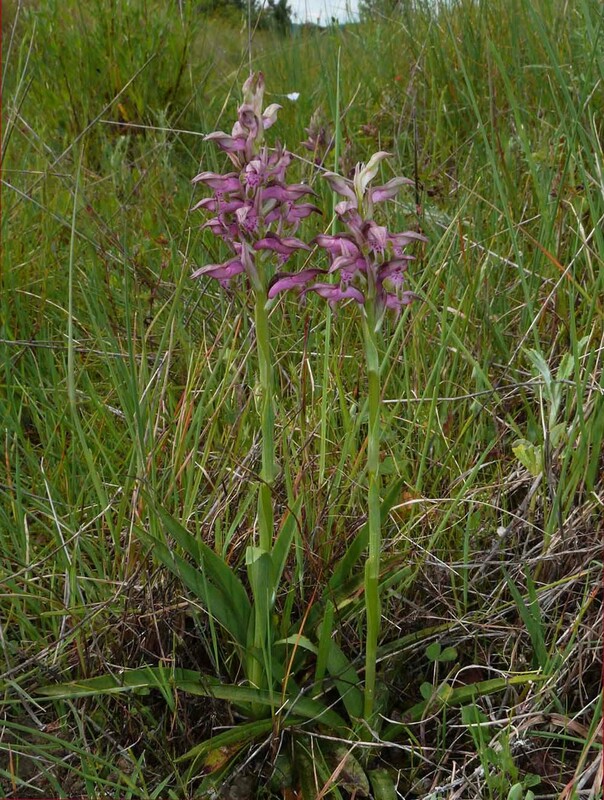 This subspecies bears a close resemblance to A. fragrans, as it is taller, spindlier and carries more individual flowers (up to one hundred in some cases) than A. coriophora. 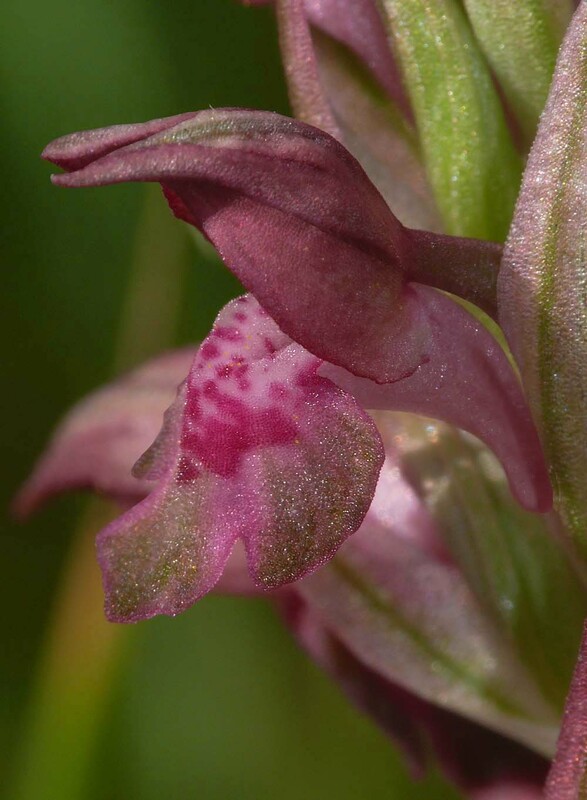 It also differs somewhat in its habitat preferences, seeming less reliant on the damp, slightly acidic conditions of its relative and capable of straying into the more typical alkaline orchid habitat of dry grassland, garrigue, scrub and even open woodland. 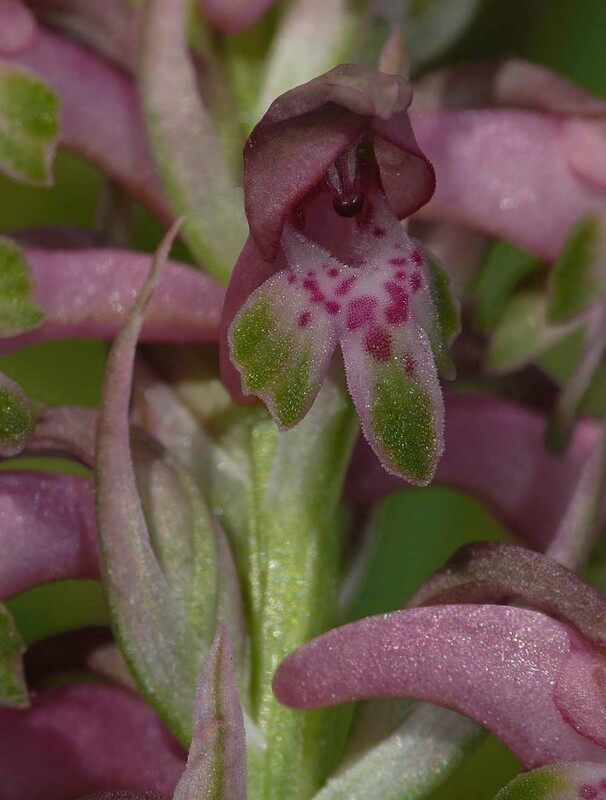 Despite the similarity to A. fragrans it can readily be distinguished from it, by inspection of the spur, which in carpetana is unmissably large and bulbous, whereas that of A. fragrans is skinny by comparison. 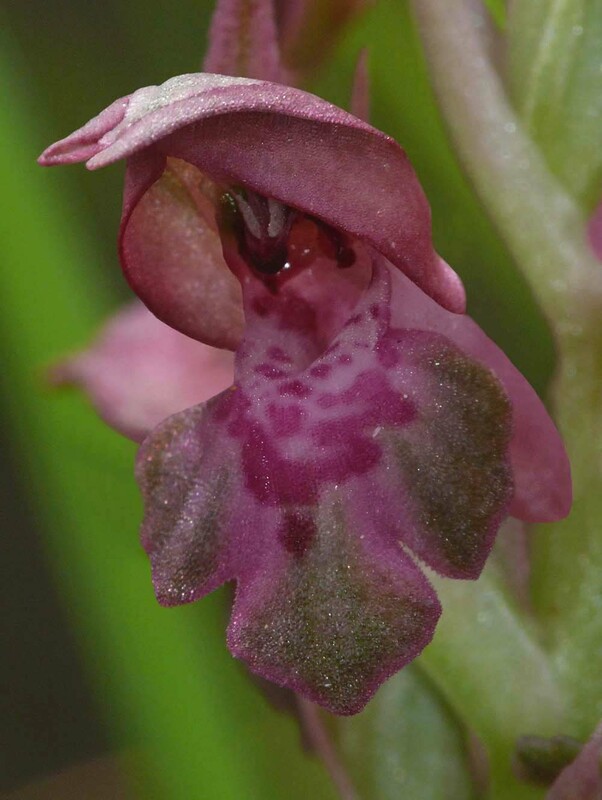 Carpetana also differs from the latter in its complete lack of fragrance and the usually wine red colouration of the flowers. 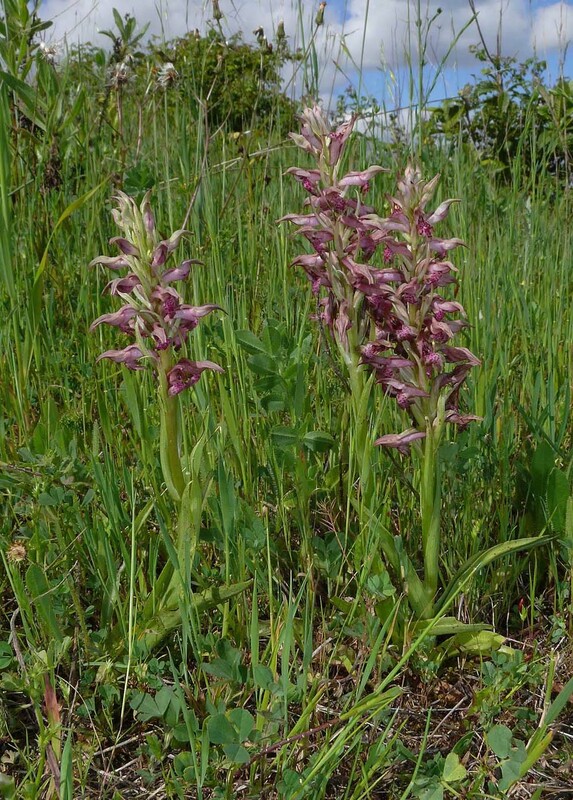 A. coriophora ssp carpetana has a limited distribution, being confined to central and southern Iberia where it can be found with the type species or in pure colonies, as was the case with the plants illustrated here. 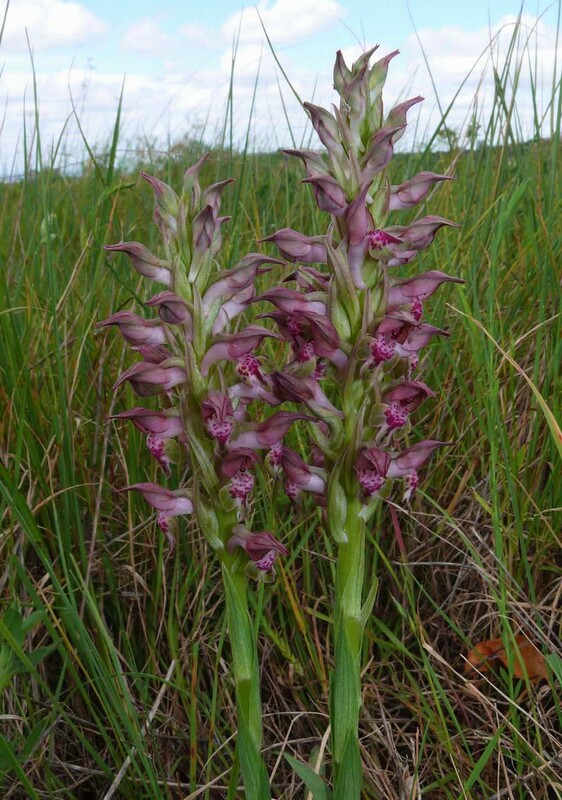 Its tolerance of drier conditions also allow it to occupy similar habitat and grow alongside A. fragrans, although whether it produces intermediates is not known. Within its limited range it can be abundant and it appears to be perfectly happy growing at considerable altitudes. The pictures come from Labruja, Portugal and date from mid April.